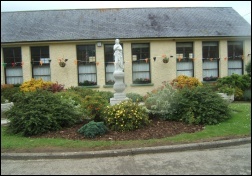 Scoil Fhoirtcheirn agus Fhinin Naofa, Myshall is a Catholic co-educational five teacher school, comprising of four main stream teachers and a resource teacher. A learning support teacher visits the school twice weekly. The Board of Management (B.O.M.) employs a school secretary, a caretaker, a school cleaner and season employees to cater for and maintain the school grounds and building. Other than the ancillary staff members, the Department of Education and Science (D.E.S.) determines the number of staff members that the school may employ on an annual basis. The B.O.M. is dependent on the allocation of various grants by the DES. The B.O.M. is responsible for the prudent use of the school's resources within the regulations as prescribed by the D.E.S. from time to time. 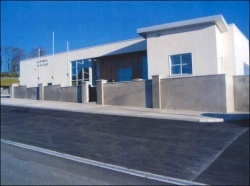 Scoil Mhuire Drumphea was opened at Easter 1967. The new school took the place of Rathnageeragh N.S. and still held the same roll number. After years of waiting in this two classroom 'temporary school' the new school was finally built. On September 12th 2003 our present school was officially opened by Bishop Moriarty. Our new state of the art school has three classrooms, a computer room, principal's office, staffroom and hall, as well as an extensive playground including hurling pitch and basketball court to promote and foster the great sporting tradition that the area of Drumphea is famous for. Many past pupils of Scoil Mhuire have gone on to represent their club and county in areas such as hurling, camogie and handball.